Following the surprise announcement that Royal Caribbean International is moving the splashy new Quantum of the Seas to China after six months in the U.S., company executives shed some light on that decision and revealed other new itineraries. “That was a ‘wow’ announcement for our brand and that was a ‘wow’ announcement for the industry,” Lisa Lutoff-Perlo, executive vice president of operations, said in something of an understatement. It’s a surprise because, traditionally, many brand-new ships are based in the U.S., the world’s largest cruise market by far, if not immediately then fairly quickly. And, based on some of the questions in a Thursday morning press conference call, some in the industry are disappointed that this new ship isn’t staying longer, even though it will be replaced at Cape Liberty in Bayonne, N.J., by its sister ship, Anthem of the Seas, about six months later, on Nov. 4, 2015. 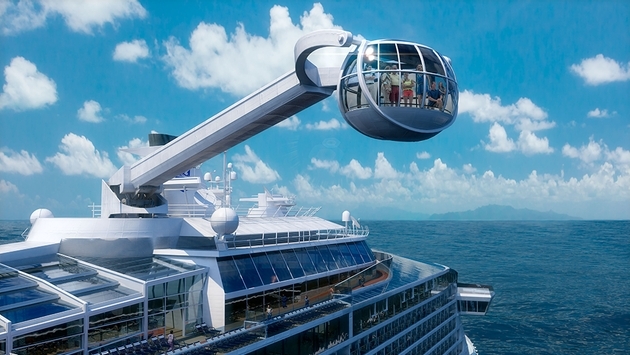 The 4,180-passenger, 167,800-ton Quantum and Anthem of the Seas will have some of the most eye-popping features ever seen on a cruise ship, including a sky-diving simulator, an indoor sports complex with bumper cars and roller skating, and the North Star, a thrill ride that will carry people 300 feet into the sky in a glass pod on a massive cherry-picker-type device. The cruise industry has been increasingly focused on the emerging markets in Asia, which have been thought to be slow-growing but potentially wildly lucrative in the long run. It remains unknown if Royal Caribbean will send any more newbuilds to Asia. Vicki Freed, senior vice president of sales, trade support and service, positioned the deployment changes as a positive for the Northeast cruise market, since Cape Liberty will get three great ships in a row — Quantum of the Seas from November until May 2, 2015, Liberty of the Seas through early November and then Anthem of the Seas. Beginning in late June 2015, Quantum will operate three- to eight-night itineraries year-round from Shanghai to Japan and Korea. More itinerary details will be announced in a month or two, said Christopher Allen, associate vice president of global deployment and itinerary planning. When it arrives at Cape Liberty, Liberty of the Seas will alternate five-night Bermuda round-trips with a nine-night Caribbean itinerary in the summer and a nine-night Canada/New England itinerary in the fall. For winter 2015-16, Anthem of the Seas will sail seven- to 12-night round-trips to the Bahamas and throughout the Eastern, Western and Southern Caribbean. The 12-night Western Caribbean itinerary is brand-new, featuring maiden calls for the Quantum class at Grand Cayman; Falmouth, Jamaica; Costa Maya, Mexico; and Roatan, Honduras. Royal Caribbean also announced other new itineraries. In Galveston, Navigator of the Seas will continue to sail seven-night Western Caribbean cruises throughout summer 2015. After leaving Cape Liberty, Liberty of the Seas will take over weekly Caribbean sailings from Galveston while Navigator will move in November 2015 to Fort Lauderdale to operate six- and eight-night Western Caribbean itineraries. Meanwhile, for winter 2015-16, Brilliance of the Seas and Vision of the Seas will return to Tampa. Brilliance offers four- and five-night Western Caribbean itineraries, while Vision of the Seas will sail seven-, nine-, and 10-night itineraries throughout the Eastern, Western and Southern Caribbean. The 2015-16 cruises by Liberty, Navigator, Brilliance and Vision of the Seas are open for booking. Crown & Anchor Society loyalty members can book Anthem of the Seas’ winter 2015-16 season starting April 25, in advance of the general opening to the public on April 29.